Whip up the 2 eggs in a small bowl so that the yolks and whites are mixed up. Pour the breadcrumbs and seasoning into a separate bowl and mix them together. Coat each chicken strip in flour. Dip the flour-covered chicken strips into the egg, covering both sides. 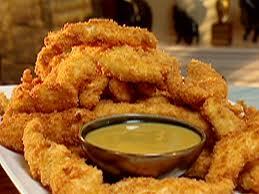 Cover the chicken strips in breadcrumbs by dipping the flour and egg covered strips into the seasoned breadcrumbs. Place the breaded chicken strips into the pan and cook in the hot oil for about 5 minutes. Turn the chicken strips over and cook for 5 minutes more. Remove the chicken tenders from the pan and allow them to cool slightly before serving.